99 hours. 12,423 participants. 86,238 tweets. Every week since July 2013 (save a few holidays and Tuesdays during Content Marketing World each September), Content Marketing Institute has hosted a #CMWorld chat. Marketers join the #CMWorld community on Twitter each Tuesday at 12pm Eastern for a conversation about trends and best practices across numerous topics impacting the content marketing community. We’ve chatted about everything from strategy to technology to ROI. But next month will mark our biggest chat yet. That’s because we will be celebrating our 100th #CMWorld Twitter chat! Our #CMWorld chat has experienced tremendous growth in the last two years. We’re proud our conversations have spanned the globe. Hundreds of marketers join us each week to network and discuss challenges in our industry. We have had the honor to host numerous guests who have given thought-provoking insights and inspired our discussions. Our first guest was NewsCred Head of Strategy Michael Brenner, and next week, Meghan Casey, Lead Content Strategist at Brain Traffic, sits in the hot seat. We are so grateful for all of the fabulous marketers who have joined our Twitter chats. To mark this milestone, we want to cast a spotlight on the #CMWorld Twitter Community Top 100, loyal members of our online community that have shared their expertise and tweeted and contributed the most since the start. Follow them. Learn from them. They are who make this community engaging and a big success. This is a great community, and we are truly humbled. 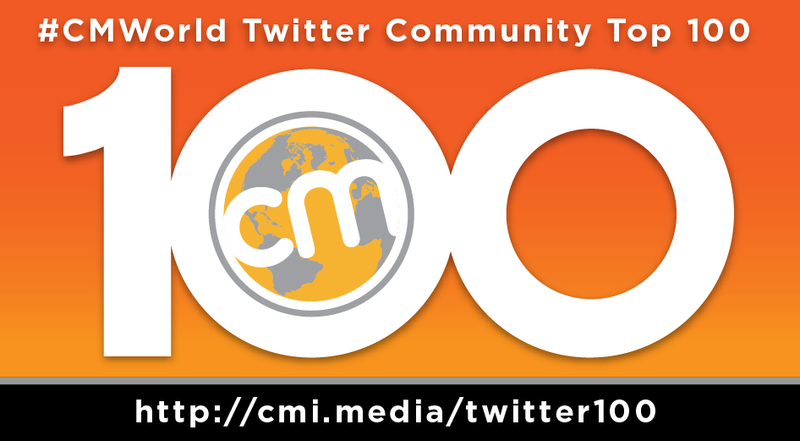 We can’t wait to celebrate the #CMWorld 100th Chat with you Tuesday, July 7, 2015 on Twitter at 12 p.m. EDT. We hope you’ll join us! Love all these folks. Thanks so much! I adore all of them too. So lucky to be a part of such a terrific, vibrant community! OMG! 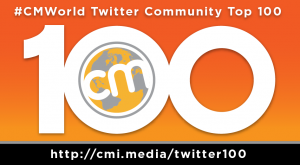 The 100th #CMWorld Twitter chat?! That’s going to be epic. Ordering my extra keyboard now since I know mine will be fried after this chat. Love this, Amy! What you’ve contributed and done for our community is just priceless. Thank you for everything! It’s going to be a blast! Good company! I can’t think of a community I’d rather be a part of! Couldn’t do this without you, Carmen! Thanks for being with us for virtually all 100! A huge group of friendly experts working hard to give away their best advice. Who wouldn’t want to be part of this community? CMI is the best! See you all on #CMWorld chat 100. Prepare to trend! Thanks, Andy! The best part is how much we’re all willing to share. It’s become so useful and entertaining and educational. Huh…almost like content marketing! 🙂 See you next Tuesday! I am honored to be included. I have learned a lot participating in #CMWorld. It has been a significant part of my learning process. Thanks to CMI for nurturing it and thanks to all the smart tweeps who participate. I hope I can add value back. You do, Bill! It’s always so great to see your name pop up on Tuesdays – then we always know it’s going to be extra insightful! Well that is kind of you to say. Thank you. Well this just made my day 🙂 — Love you guys. No, really….I do! In such great company! I KNOW! The people on this list – each and every one make me smile. Now that is a list! Agree! 🙂 It’s such a great crew! Thanks for the recognition! And great 100th chat today! Now following everyone on this list. What a spectacular community! I’m proud to be a part of it. Joe, I think the Kyle Akerman that’s in our group is @KyleAkerman, not @KyleAckerman.